On a cold Sunday afternoon, I enjoy cooking up a big batch of comfort food. So last Sunday, I found a new recipe to try from my bon appetit magazine ( thanks to my brother in law, Jon, for the subscription). The February issue is all about delicious pasta recipes and I selected ' Rigatoni with Spicy Pork Ragu ' to cook for my family. They loved it! Don't you love the smell of onions and garlic cooking? Add reserved meat and tomato purée and 1 cup water. Bring to a boil. 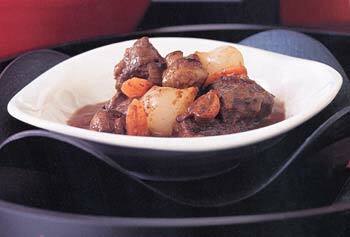 Reduce heat; simmer, adding more water as needed to keep meat nearly submerged, until meat is tender, about 4 hours. Season with salt. DO AHEAD: Ragù can be made 3 days ahead. Let cool. Cover and chill, or freeze for up to 2 months. Reheat before continuing. This sauce is best with short tubular pasta. It was delicious and makes such a large batch that I have some in the freezer for another great dinner. Here are links to 2 more of my favorite comfort food meals - Marcella Hazan's Spaghetti Bolognese here and Beef Bourguignon from Gourmet Magazine here.